They released pics of the car on T-Hunt last week. It is 1/64th and the Box has the lights and sounds, not the car which is kinda sad... The wheels are also miss the mark and the T-tops are framed??? I was disappointed as I made my 1$ KITT with real riders look much better than this. Nice to see it making a ComiCon appearance though. will the show knight rider (new one) be still on or is it canceled for ever ? It cannot be a 1/64th with a working scanner. I would guess a 1/43rd scale most likely. I have asked at HotWheels and will post when they answer. Interesting.... Its selling well even before they show anything other than the packaging... I wonder how the car will look like. They did not mention the scale either... 1/43? 1/64? A retool of the current 1/64 Hot Wheels KITT perhaps? But it talks, so could it be a 1/18 KITT??? 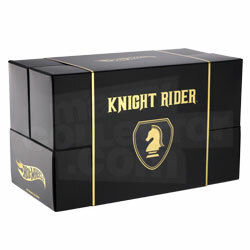 I went to the hot wheels site but could not find the knight rider hot wheels, nor could I find where to pre-order them.